Sriduangkaew’s tale starts with Julienne, a young woman approaching her mid-twenties and struggling to become the strong, sure adult she longs to be. Julienne is sensitive, insecure, and a little neurotic. There are hints of a dysfunctional family, of loss, of struggles with mental instability or illness (“tinted bottles lining up at the vanity”, “appointments in fluorescent-lit clinics”). Julienne thinks it isn’t right that at twenty-four, “…she still finds herself with problems that should’ve been shed with adolescence, like bad hair and acne.” For those of us who have had similar thoughts, it is a relief to hear them articulated so clearly and so well from such a likable character. Julienne has two immortal aunts, namely Chang’e and Houyi. Technically, it is Chang’e, the Moon Goddess, who is Julienne’s aunt. Houyi, the Archer, is her aunt’s wife. Of course, the Archer of legend is generally presented as male, but in Sriduangkaew’s tale, she is female; thus Julienne is gifted with both an aunt and an aunt-in-law to look after her. Houyi stands on the first letter of HSBC, ancient myth-feet resting on logo black on red, under which throbs a mad rush of numbers and commerce and machines: trades riding cellular waves and fiber optic, fortunes made and shattered in minutes. She does not shade her eyes (emphasis mine). 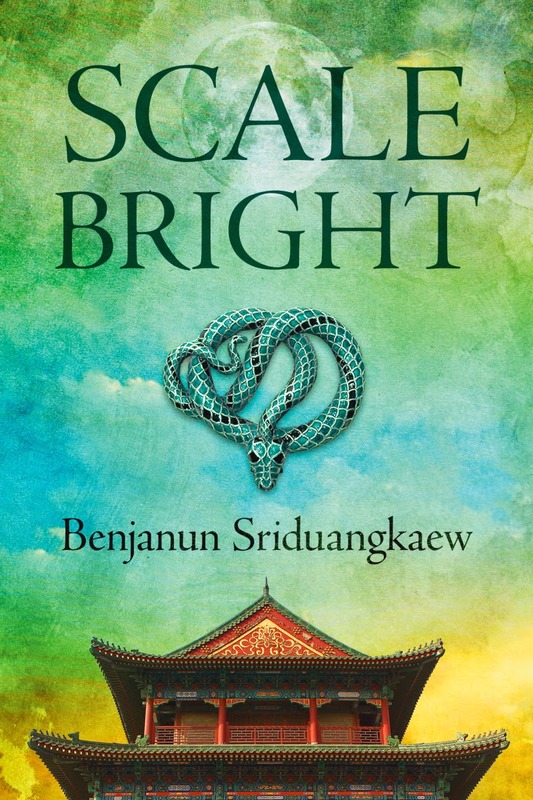 To be clear, Scale Bright is not a modern re-telling of this old tale, or it is not merely that. The story of Houyi the Archer and Chang’e the Moon Goddess serves as the background for what is happening now, in a world where ancestors and history are alive and present in our contemporary lives, continuing to exert influence in the world. These histories and legends also intersect with one another, and this is where the White Snake comes in. “The Legend of the White Snake” is, more accurately, a legend of a white snake and a green snake, two magical serpents that are able to take human form. Interestingly, even the original ancient Chinese legend is a story that involves a strong love between two females. In short, the white snake becomes imprisoned for eternity by a jealous spirit. The green snake, with a loyal and selfless love for the white snake, attempts to free her. Although the green snake refers to the white snake as “Elder Sister” there is also an unmistakeable romantic aspect to the love she bears her. In Scale Bright, the green snake is a demon by the name of Olivia Ching or Xiaoqing. Although she is called a demon, she is not presented as particularly evil. Olivia is pursued by the maniacal monk Fahai, an ally of the immortal emperor Dijun (father of the suns) who is also the enemy of Houyi. It is hinted that Dijun may, in fact, have purposely induced Houyi to kills his nine sons for his own selfish purposes. When Julienne becomes entangled with Olivia and her aunts step in, worlds and legends collide and an adventure ensues. This adventure takes Julienne to Banfaudou, the “place in between,” as well as to the heavenly realms. Like the best literary adventures, our protagonist learns about her own world as well as other worlds, about who she is and what she really wants, and about what she is capable of doing when the stakes are high. It can be difficult to describe a story which is a myth or fantasy without it sounding slightly ridiculous, but make no mistake, this novella is a serious work that succeeds on multiple levels. The story contains messages about the importance of family, about the possibility of enduring relationships of tenderness and strength that break traditional rules, and about courage, loyalty and tenacity. It also speaks to the possibility of growth and learning at any age and stage of life. Moreover, the characters in Scale Bright are interesting, nuanced and believable. I would personally have liked to see one or two positive male characters; however, given that the number of important protagonists in this story is limited, this is not a significant lapse. As far as the female characters go, they run the gamut from flawed to heroic, and often both at once. The plot of Scale Bright is fairly straightforward and contains no real surprises. This is probably fortunate, because at least for Western readers, a certain amount of confusion arises simply from the names, the places, and how the worlds of legend function in the story. For example, the character Hau Ngai is also called Houyi and the Archer; Seung Ngo is also Chang’e and the Moon Goddess; Olivia Ching or Xiaoqing is also the green snake, the serpent, and a demon; Bai Suzhen is the white snake; there is some kind of a fox associated with the names Daji and Nuwa; and there are the parents of the suns—Xihe, and Dijun, who is likewise an emperor. It is not completely clear which of these characters are gods and which are immortals and whether there is a difference between the two. And where exactly do demons fit into this hierarchy? Other questions also arise, such as what rules restrict access to Banfaudou and the heavenly realms. The reader might also like to know exactly how Julienne came to have immortal aunts, since it is hinted that this is a very recent development. Heaven comprises of nothing save technicalities. There are eternal scribes devoted to the task of documenting such. Other words of existential wisdom abound in Scale Bright. There is Olivia’s realization that “…she is only human in outline, a vessel into which the serpent is uneasily poured.” While Olivia may, at times, long to be human, Julienne longs to be more like her immortal aunts. “To have poise without trying, to have beauty without effort. To be impossible.” Later in the story, Julienne’s body “… thrums with an urge to run, to leap, to be more than it is.” These sentiments are universal, expressing the frustration of living with limitations, the weight of mortality, the shame of imperfection, and the pain of being able to imagine but not realize a better, more perfect existence. More mundanely, this story tells of the courage needed not only to be more than you thought you could be, but also to ultimately accept yourself. As our bodies are a vessel for our natures, this story is a vessel for certain truths and ideas, and also for Sriduangkaew’s gorgeous writing. As a novella containing elements of a number of different genres, the reader has the opportunity to appreciate writing with a variety of rhythms, flavors and textures. At eight, buildings across the harbor ignite, LEDs running in colors that—filtered through Hau Ngai’s touch—give her the smell of lotus-seed paste, the richness of salted yolk. Spotlights and lasers vivisect the night. There is very little to criticize in the writing. There were certain moments when I felt that the author used more words than necessary to describe something, taking an extra step or two past where she should have stopped. In most of the novella, there was an impressive economy in the language, but ever so often, it was as though Sriduangkaew did not have the confidence to realize that she had already nailed it. Scale Bright asks not only this question but whether you have the wisdom to recognize this thing when you see it and the courage to hold onto it once you have found it.